The Reverend Robert R. Hitchens, Jr. is a native of Chillicothe, Ohio. He is a 1987 graduate of the University of Dayton, with a Bachelor of Science Degree in Business Administration, majoring in Accounting. In 2001 he completed a graduate program in Operations Management from the Eli Broad School of Management at Michigan State University in East Lansing, Michigan. Currently, Rev. Hitchens career has him in Chillicothe as Service Center Manager for Anixter, Inc. – A Fortune 500 company based in Chicago, IL. Prior to that he was the Director of Materials Management at Mill’s Pride (Masco Corporation) in Waverly, Ohio. He spent over 20 years there in various positions including Accounting and Procurement. Rev. Hitchens also has his own Tax and Accounting business which caters to individuals and small businesses. In the spring of 1992, Rev. Hitchens, became a member of First Baptist Church after accepting Jesus Christ as his Lord and Personal Savior. During the past two decades, Rev. Hitchens has served in various roles in the church including Sunday school teacher Bible Study Teacher, choir member, finance and budget analyst and associate minister. In 1994, he was ordained as a Deacon where he served until the fall of 1998 when he accepted a call from the Lord to preach the Gospel. In the spring of 2001, Rev. Hitchens was licensed to preach the gospel, by the First Baptist Church and his Father in the Ministry the Reverend Jonathon J.H. McReynolds . On February 21, 2003 after two plus years of training under the leadership of his pastor, Rev. Hitchens was officially ordained, along with his good friend, the Rev. Steve Ragland. Over the past thirteen years Rev. Hitchens has served in various ministry capacities. Those include New Members Instructor, Youth Leader, Associate Pastor, Revivalist, Workshop Presenter/Lecturer but most of all a Servant of our Most High God. Over the past five years, Rev. 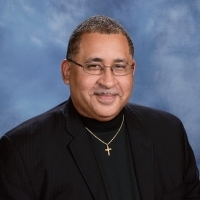 Hitchens has also been honored to serve in an interim Pastor role for Second Baptist Church, Circleville, Ohio and for over 14 months as interim Pastor for First Baptist of Chillicothe. Of the many blessings and accomplishments that the Lord has blessed Rev. Hitchens with, the most satisfying one has been his marriage of over 20 years to the former Monica L. Patton of Lima, OH. Monica has been very active in the church, school district and community is Reverend Hitchens’ constant support. The Lord has blessed them with two wonderful children, Lauren (18), who is a freshman at the Ohio State University and Robert III (Trey) (16). To God be the Glory!